1 "Then all the congregation of the sons of Israel journeyed by stages from the wilderness of Sin, according to the command of the LORD, and camped at Rephidim, and there was no water for the people to drink. 2 Therefore the people quarreled with Moses and said, "Give us water that we may drink." And Moses said to them, "Why do you quarrel with me? Why do you test the LORD ?" 3 But the people thirsted there for water; and they grumbled against Moses and said, "Why, now, have you brought us up from Egypt, to kill us and our children and our livestock with thirst ?" 4 So Moses cried out to the LORD, saying, "What shall I do to this people? A little more and they will stone me." 5 Then the LORD said to Moses, "Pass before the people and take with you some of the elders of Israel; and take in your hand your staff with which you struck the Nile, and go. 6 "Behold, I will stand before you there on the rock at Horeb; and you shall strike the rock, and water will come out of it, that the people may drink." And Moses did so in the sight of the elders of Israel. James Smith THE SMITTEN ROCK. Exodus 17:1-7. I. A Condition of Desperate Need. 1. They Dwelt in a Barren Place. "There was no water" (v. 1). This world of itself can never supply the wants of a human soul. All its cisterns are broken. Separated from the Cross of Christ, our abode is in "waste places." The rebellious dwell in a dry land (Psalm 68:6). 2. Their Souls were Thirsty. "The people thirsted" (v. 3). When the thirst came the barrenness of the land was felt. When the Spirit of conviction and dearth takes possession of the soul, then the emptiness of the world's pleasure wells is realized. This water of satisfaction cannot be got by digging) such work is worthless. Blessed are they that thirst after righteousness. II. An Unexpected Source of Supply. "There shall come out water" (v. 6). 1. It Came from a Rock. Worldly wisdom could not by searching find out this method. Men can more easily expect fire from a rock. "Can any good thing come out of Nazareth" (John 1:46). My ways are not as your ways, says the Lord (Isaiah 55:8). 2. It Came from a God-possessed Rock. "I will stand upon the rock" (v. 6). Pause and think of this. How very suggestive of the great Incarnation. God was in Christ (2 Corinthians 5:19). The rock in Horeb of itself could do nothing, but God in the rock could do anything. The rock represents the human nature of the Lord Jesus, God on the rock, His divine power and Godhead. The source of our salvation is in God, the channel of communication is Jesus. He is "both Lord and Christ" (Acts 2:36). III. An Unlikely Means Used. 1. The Rock was to be Smitten. "You shall smite the rock" (v. 6). This thought never originated in the heart of man, that salvation could be brought forth by smiting the anointed of God. "But He was wounded for our transgressions, with His stripes we are healed" (Isaiah 53:5). The sword must awake against the man that was God's fellow. Oh, worship the Lord! 2. The Rock was to be Smitten with a Rod. "Your rod, with which you smote the river, take in your hand" (v. 5). This was the rod of judgment that turned the river into blood, and the sign of God's authority and power. "It pleased the Lord to bruise Him; He has put Him to grief" (Isaiah 53:10). Concerning the sufferings of Christ we may truly say, "This is the Lord's doing, and it is marvelous in our eyes" (Psalm 118:23). IV. A Merciful Provision Made. 1. The Supply was Abundant. "The waters gushed out, and the streams overflowed" (Psalm 78:18-20). "They did all drink the same spiritual drink." When Christ, our Rock, was smitten, "forthwith came there out blood and water," emblems of a full salvation, atonement, and cleansing. "We have redemption through His blood," and cleansing through the washing of the Word. "Whoever will may come and take of the water of life freely" (Rev. 22:17). 2. The Supply was Free. "He, every one that thirsts, come you" (Isaiah 55:1). It was "without money and without price." Thirst is the only condition, but it is indispensable to the enjoyment of the God-given waters of salvation. The apostle declares that the spiritual rock "followed them." The Salvation of God in Christ is not only perfect in its character, but continuous in its application. The power of His atoning blood still follows the generations of men. Let us thank God that this saving rock has followed us. It is following you—drink and live! Where highway construction is taking place, a sign frequently will be posted that reads, "Give 'Em a Brake." This has a double message: one is to slow down, and the other is to spare the workers from injuries caused by carelessness. Highway workers do their job under hazardous conditions and we need to give them a "brake." The same sign could have been posted outside the tents of Aaron and Moses. 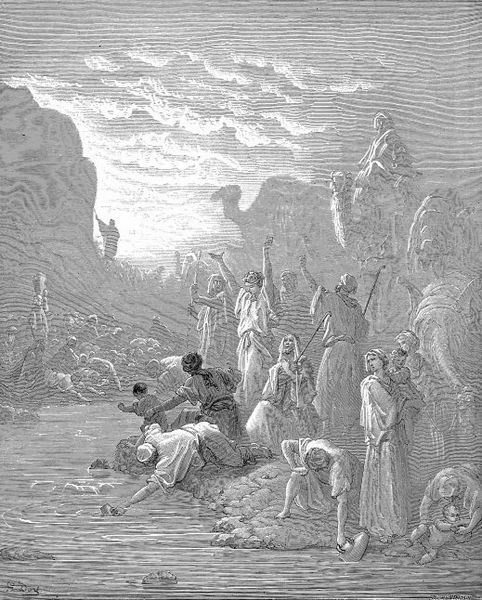 Time after time the people of Israel rushed into judgment against their leaders until finally, here at Rephidim, they were ready to stone Moses to death (v. 4). Only God's intervention prevented a tragedy. Without question, these people needed to give Moses a break. This sign would fit equally well in front of the homes of many pastors and other church leaders. A study by Leadership Journal and Christianity Today, Inc., found that 22.8 percent of pastors have been fired or forced to leave their churches at least once in their career, and one in four of these has experienced this more than once. Sixty-two percent of the discharged pastors said the church that let them go was a "repeat offender" and had fired at least one previous pastor. Isn't it time we gave a break to those called of God to lead His church? Be very careful when tempted to be critical of your pastor or other church leaders. You may find yourself not only opposing them but God as well. Slow down before passing judgment, sincerely check your motives, and make sure there is a sound, biblical reason for your complaint and not simply a personality issue. More often than not, what you need to do is "give 'em a brake." The most recent version of Apple's iPhone supports software that can do much more than make and receive calls. One feature is its ability to recognize any song, sung either by the original artist or a cover band, and display the album cover on its screen. For instance, you might be walking through a store, and your iPhone can identify the songs playing on the store's speaker system. We don't need an iPhone to recognize the refrain at the beginning of Exodus 17. It's the tune of “Woe is Me!” by the band called the Israelites. It sounds like a funeral dirge played in a minor key. In this variation, the Israelites were thirsty and convinced they were about to die. As He's done from the very beginning of the book of Exodus, God deliberately seems to bring His people face to face with hardship. When He first commissioned Moses to lead the people out of Egypt and Moses made his plea before Pharaoh for the freedom of the Israelites, their slavery instantly worsened. When they were finally freed, God led them on an indirect route out of Egypt and even commanded them to turn back, inciting the Egyptians to chase them down. And now, as they journeyed through the wilderness, they set up camp (at God's command) at Rephidim, the most unlikely of sites. There was no water, and they were completely vulnerable to the enemy. God wanted the Israelites to discover that they could depend on Him, not their own ingenuity or sufficiency. Without the thirst and hunger, without being attacked by enemies, they would never have learned that their daily bread came from God, and that God alone was their protection. God commanded Moses to record the events of their journey through the wilderness, in part because these stories would be sources of instruction and encouragement to us even today. Do you journal regularly? Sometimes, the act of writing and then rereading about our own personal journey can illuminate the patterns of how God is at work. If only the Israelites had seen the pattern of hardship on their journey and understood that it was never a time to despair but to expect God's deliverance! Consider, for example, the bad habit developed by the people of ancient Israel. They had just been delivered from slavery (Exodus 14:30), and they ought to have been thankful. Instead, they started to complain to Moses and Aaron, “Oh, that we had died by the hand of the LORD in the land of Egypt!” (16:3). We read in Exodus 17 that their complaining escalated into a quarrel. In reality, their complaint was with God, but they picked a fight with Moses because he was the leader. They said, “Why is it you have brought us up out of Egypt, to kill us and our children and our livestock with thirst?” (v.3). The people even began questioning if God was really with them (v.7). Yet He always met their needs. If we’re honest, we would have to admit that we sometimes complain when God isn’t coming through for us the way we want. We accuse Him of being absent or disinterested. But when our heart is concerned with God’s purposes rather than our own, we will be patient and trust Him to provide all that we need. Then we won’t develop the bad habit of complaining. Sadly, Israel would not consistently follow Moses’ example of faith. Ultimately, “the word which they heard did not profit them, not being mixed with faith” (Heb. 4:2). When it came time for Moses to strike the rock in the desert to get water for the thirsty Israelites, his part was very small-just strike the rock. Anyone in Israel could have done it. The main thing was what God was doing in the heart of the earth to provide a bountiful river of water. But the two worked together: Moses before the people; God in the hidden depths of the earth. Moses and God were fellow workers. There are always two agents in every fruitful work: willing workers and a faithful God. The human part is to do whatever God has asked us to do-strike the rock. God’s work is to make the water flow. Was Moses weighed down with anxiety that day as he approached the rock, thinking that he might fail? I doubt it. He had only to follow the Lord in obedience. God had promised to do the rest. And Moses had seen God work mighty miracles in the past. Are you anxious about the task God has given you to do today? Do you believe that everything depends on you? Just strike the rock. God is working in secret to pour out rivers of water for every man, woman, and child. And when living waters begin to flow, praise Him. Just do your part and He’ll do His. The importance of water can never be underestimated. Sixty percent of a lean, adult body is composed of water. A person can fast from food for 40 days or longer, but the human body can go only for about 7 days without water even under ideal circumstances. It's no wonder, then, that the Israelites were getting desperate. The wilderness was far from ideal. It was a hot, desert-like stretch of land dotted with huge rocks but little vegetation. Without water they would quickly perish. So God instructed Moses to strike a rock, and out of this flinty hardness flowed sufficient water to meet the needs of all the people and their livestock. The Bible writers later saw this rock as a symbol of Christ (1 Cor. 10:4). In the midst of a sin-parched life, Christ offers a well of living water that never runs dry, no matter how often we drink from it. Have you received Christ as your Savior? If not, trust Jesus today and you will never thirst again. If you want eternal water, come to Jesus who said, "Whoever drinks of the water that I shall give him will never thirst. But the water that I shall give him will become in him a fountain of water springing up into everlasting life" (John 4:14). I will stand before thee upon the rock in Horeb, and thou shalt smite the rock. Here is a beautiful example of the co-operation between God and his servants in providing for the needs of his people. Clearly the smiting of the rock was a very small item in this incident, the main consideration was what God was doing in the heart of the earth. But the two wrought together: Moses in the eyes of the people, God in hidden depths. Similarly we are fellow-workers with God. One of the greatest revelations that can come to any Christian worker is the realization that in every act of Christian ministry there are two agents, God and man: that God does not need to be implored to help us, but wants us to help Him; that our part is the very unimportant and subsidiary one of smiting the rock, whilst his is the Divine and all important part of making the waters flow. Did Moses go to the rock that day weighted with care, his brow furrowed with the anxiety of furnishing a river of which his people might drink? Certainly not; he had only to smite: God would do all the rest, and had pledged Himself to it. So, Christian worker, you have been worrying as though the whole weight of God’s inheritance were upon you, but you are greatly mistaken; smiting is very easy work. In every congregation and religious gathering the Holy Spirit is present, eager to glorify Christ, and to pour out rivers of living water for thirsty men; believe this. See that you are spiritually in a right condition, that He may be able to ally you with Himself. Keep reckoning on Him to do his share; and when the river is flowing, be sure not to take the praise. The water flowing from the rock indicates the provision for life. The psalmist said, "Behold, he smote the rock, that the waters gushed out, and the streams overflowed" (Ps. 78:20). The smitten rock pointed to the smitten Christ who paid the penalty of sin. The gushing streams of water picture the gracious supply of life through the Holy Spirit. God smote His Son and raised Him from the dead, thereby sending forth the life-giving stream, but man must come and drink. Although Jesus Christ has paid the penalty of sin for all (1 John 2:2), only those who personally receive Him as Saviour have forgiveness of sin and eternal life (John 1:12; 5:24). When God provides, He provides abundantly. When God provided water for the Israelites, the psalmist said, "He opened the rock, and the waters gushed out; they ran in the dry places like a river" (Ps. l05:41). Concerning the life that the Lord Jesus Christ provides, He said, "I am come that they might have life, and that they might have it more abundantly" (John 10:10). This coincides with the way Jesus compared the Spirit to the abundance of running water (John 4:14; 7:37,38). So the rock in the wilderness prefigured Jesus Christ. A standing joke among pastors is that the ministry would be great if it weren’t for the people! But, of course, the ministry is people. Since all people are fallen sinners and even the saints are not perfectly sanctified, if you’ve got people, you’ve got problems. And since Satan is opposed to Christ’s church, we can expect problems from within and problems from without. God’s people and His leaders should drink from Christ to deal with problems from within and problems from without. 1. God’s people and God’s leaders should drink from Christ to deal with problems from within (Exod. 17:1-7). The people’s grumbling against Moses is similar to the incident in Numbers 20:1-13, but there are enough differences to conclude that they are not the same. In both incidents, the people grumbled about no water and the place was named Meribah (“quarrel”). In both places, God gave the people water from the rock through Moses’ action. But, Exodus 17 occurs near the beginning of Israel’s time in the wilderness; Numbers 20 occurs near the end of the forty years. In Exodus 17, the Lord commanded Moses to strike the rock with his staff and Moses obeyed. In Numbers 20 the Lord told Moses to speak to the rock, but in his anger with the people, he struck the rock. Because he disobeyed, the Lord prohibited Moses from leading Israel into the Promised Land. A. God’s people should be on guard against an evil, unbelieving heart that grumbles against God’s dealings with them. The first thing we need to recognize here is that the Lord directly led Israel to Rephidim (“resting place”) where there was no water. Verse 1 states that they journeyed “according to the command of the Lord.” They weren’t lost! So you have to ask, “Why did God directly lead Israel to another place of no water?” The answer is: For the same reason He brings us into places of need: so that we will call upon Him in our weakness and He will be glorified when He delivers us. The Lord says (Ps. 50:15), “Call upon Me in the day of trouble; I shall rescue you, and you will honor Me.” So if you’re in a place of trouble, before you do anything else, call upon the Lord. If you’ve been grumbling, confess that to the Lord and ask Him to be glorified through the trial that you’re in. Hebrews 3:7-11 cites those verses and adds (Heb. 3:12), “Take care, brethren, that there not be in any one of you an evil, unbelieving heart that falls away from the living God.” Grumbling stems from “an evil, unbelieving heart.” Unbelief tests or tries the Lord (Exod. 17:7; Ps. 95:9). In spite of His many mercies, when problems arise, unbelief challenges God by asking (Exod. 17:7), “Is the Lord among us, or not?” In other words, unbelief asks, “If God is really here and cares about me, how can He let this happen?” Unbelief doubts God’s sovereignty, His power, His wisdom, and His love. It removes God from His rightful place as judge and puts Him on trial, while I judge Him, questioning His ways of dealing with me! It stems from the pride of thinking that I know better than God what would be best for me. Be on guard against grumbling against the Lord! B. God’s people should be on guard against grumbling against God’s leaders. Grumbling against the Lord often comes out as grumbling against spiritual leaders who are seeking to direct you to the place of God’s blessing. Even though Moses was one of the greatest leaders in history, the grumblers accused him of bringing them and their children into the wilderness to kill them (v. 3)! Actually, in obedience to the Lord he was trying to lead them to a land flowing with milk and honey. Even the greatest Christian leaders do not share Moses’ intimacy with God or his leadership gifts. But even so, Hebrews 13:17 exhorts the church, “Obey your leaders and submit to them, for they keep watch over your souls as those who will give an account. Let them do this with joy and not with grief, for this would be unprofitable for you.” Paul commanded Titus (2:15), “These things speak and exhort and reprove with all authority. Let no one disregard you.” He instructed Timothy (1 Tim. 5:17), “The elders who rule well are to be considered worthy of double honor, especially those who work hard at preaching and teaching.” “Double honor” refers both to respect and financial support (see v. 18) for those who preach the Word. But you can’t be in submission to a leader or honor him while at the same time you’re grumbling about him to others. Often, if people don’t like God’s message, they express it by attacking His messenger. If your complaint is something other than a sin issue, then after praying about it and checking your attitude, go directly to the leader and share your concerns. If he doesn’t listen and it’s an important enough matter, take two or three with you and try again. But don’t go in anger just to vent. Don’t question the leader’s motives, as Israel here accused Moses of trying to kill them (Exod. 17:3). Your aim should be to glorify God by helping the leader and the church. But be careful, because as Moses pointed out (v. 2), by quarreling with him, the Israelites were really testing the Lord. C. God’s leaders should take every problem from within to the Lord and rely on His sufficiency to deal with it. Moses’ staff (v. 5) was the symbol of God’s power. It was the same staff with which he had struck the Nile and divided the Red Sea. He will use it again to help the Israelite army prevail against Amalek (v. 9). It showed both the elders and the people that the power was not in Moses, but came from the Lord. Moses was just the man whom God used. God instructed Moses not to go it alone, but to take with him some of the elders of Israel (v. 5). We’re not told whether the elders were trusting God along with Moses or griping along with the people, but the text emphasizes twice that Moses did this miracle with the elders (vv. 5, 6). God’s purpose may have been to teach the elders to trust in His sufficiency, to teach the people that Moses was not acting by himself, and to protect Moses from being killed. The New Testament teaches that the local church is to be governed by a plurality of elders, also called pastors or overseers (Acts 14:23; 15:2; 20:17, 28; Eph. 4:11; Phil. 1:1; Titus 1:5, 7; 1 Pet. 5:1-4). It should never be a one-man show. When there is a problem, the elders should come together in prayer, seeking God’s wisdom through His Word, and then act together for the good of the church. It should be evident that they are relying on the Lord’s sufficiency, not on human methods or schemes. D. God’s gracious provision to deal with His people’s problems is to give them Christ, who is water from the rock. God’s provision of water from the rock demonstrates His grace toward His grumbling people. In Exodus 16:3-4, when the people complained about no food in the wilderness, without rebuke God graciously promised to rain bread from heaven on them. Here, again without rebuke, He instructs Moses to strike the rock so that water would come out to satisfy the people’s thirst. His grace was rebuke enough for their grumbling. When the Lord told Moses (v. 6) that He would stand before him on the rock, we don’t know whether the entire congregation saw a visible manifestation of the Lord or not, but if they did, it was a further rebuke of their challenge (v. 7), “Is the Lord among us, or not?” But either way, the water suddenly gushing from a rock in that barren desert was gracious proof that the Lord was in fact among them. In 1 Corinthians 10:4, Paul makes a surprising comment on this incident: “and all drank the same spiritual drink, for they were drinking from a spiritual rock which followed them; and the rock was Christ.” He means that the rock that supplied the living water for Israel was a type of Christ, who provides living water for all who thirst and ask Him for it (John 4:10-14). When he says that the rock followed them, I think Paul was using a manner of speaking to say that Christ went with Israel through the desert and that at His word, any rock became a fountain of water to satisfy their thirst. Just as the manna was spiritual in that it came from God and taught a spiritual lesson, so the rock was spiritual in that at God’s word, it brought forth abundant water and also showed the sustenance and refreshment that we find in the Lord Jesus Christ. At the very end of the Bible is this wonderful invitation (Rev. 22:17), “The Spirit and the bride say, ‘Come.’ And let the one who hears say, ‘Come.’ And let the one who is thirsty come; let the one who wishes take the water of life without cost.” Are you spiritually thirsty? Three times the Spirit and the bride (the church) invite you to come to Jesus, the water of life. And, it applies also to the church and her leaders who are dealing with problems in the church: Come and drink more deeply from Jesus, our Rock who provides abundant living water for thirsty souls! Thus, God’s people and God’s leaders should drink from Christ to deal with problems from within (Exod. 17:1-7). 2. God’s people and God’s leaders should drink from Christ to deal with problems from without (Exod. 17:8-16). It was only after God supplied Israel’s need for water from the rock that they then had to face their first enemy from without, a desert tribe called Amalek. Until now, God has done everything for Israel: He struck the Egyptians with the ten plagues; He divided the Red Sea; He destroyed Pharaoh’s army in the sea. He graciously has provided both water and food in the barren desert. All of this pictures our salvation, in which God does it all. We receive salvation by grace alone through faith alone in Christ alone, apart from works, so that no one may boast (Eph. 2:8-9). A. God’s people and His leaders must fight the world, the flesh, and the devil, which seek to destroy them. Amalek was a grandson of Esau through a concubine of his son Eliphaz (Gen. 36:12). Esau was a worldly man who despised his birthright for a bowl of stew. He succeeded in the world, but he didn’t know the God of his fathers. Centuries after Moses, God commanded Israel’s first king, Saul, to destroy Amalek because of this attack on Israel in the wilderness (1 Sam. 15:2-3). But Saul compromised, sparing Agag, the Amalekite king, and some of the best sheep and oxen. Because of Saul’s disobedience, God removed him as king and replaced him with David. Later, some Amalekites raided Ziklag, taking captive the families of David and his men (1 Sam. 30). He was able by God’s direction to slaughter many of them and recover their families and belongings. But the Amalekites plagued Israel even into Hezekiah’s time, three centuries after David. And three centuries after that, Haman, a descendant of the Amalekite King Agag, attempted to annihilate the Jews in Esther’s time. So they were perpetual enemies of Israel (Jud. 6:33; Ps. 83:4, 7). Several devotional writers say that Amalek represents the flesh that believers must constantly battle. They may be right, but since the flesh is an enemy from within and Amalek was an enemy from without, I think that Amalek represents our broader threefold enemy: the world, the flesh, and the devil. We’re engaged in perpetual spiritual warfare against these enemies of our souls. If you compromise with such aggressive enemies, they will eventually dominate your life and destroy you. First, Israel had to drink from the rock, which is Christ. But then, they had to take up their swords and actively fight this enemy. The point is, the Christian life is not an easy stroll in the park; it’s a daily battle against powerful forces of evil that threaten to destroy us. How do we fight the battle? B. God’s leaders and God’s people fight by prayer, by using means in the battle, and by remembering God’s perpetual opposition to the enemy. 1) GOD’S LEADERS AND GOD’S PEOPLE FIGHT BY PRAYER. Some object to the interpretation of Moses’ uplifted hand holding his staff as prayer, since the text does not say that he was praying. True, but his staff represented God’s authority and strength. By holding it up, Moses was clearly appealing to God for His help in the battle. When he held it up, Israel prevailed. When he let it down, Amalek prevailed. So it seems to be a picture of prevailing prayer that lays hold of God’s strength. This interpretation may be supported by a difficult phrase in verse 16. The NASB translates, “The Lord has sworn,” but the literal translation is, “a hand upon the throne of the Lord.” The difficulty is, “Whose hand is upon the throne?” If it is the Lord’s hand, then He is raising His hand to swear perpetual battle against His enemy, represented by Amalek. It could refer to Amalek’s hand against the Lord’s throne. But more likely, it is Moses’ hand, which pictures his hand lifted to God’s throne in prayer (see Philip Ryken, Exodus [Crossway], p. 461.) This view fits with Ephesians 6, where after describing our need to put on the full armor of God to do battle against the spiritual forces of darkness, Paul adds (Eph. 6:18), “With all prayer and petition pray at all times in the Spirit, and with this in view, be on the alert with all perseverance and petition for all the saints.” We prevail against the world, the flesh, and the devil through prayer that lays hold of God’s riches in Christ. 2) GOD’S LEADERS AND GOD’S PEOPLE FIGHT BY USING MEANS IN THE BATTLE. Moses prayed, but Joshua had to choose men and go out and fight with their swords against this enemy. This is the first mention of Moses’ successor, Joshua, in the Bible. Under his leadership, Israel would conquer the Canaanites. In the same way, we must pray, but also we must use the means that God has given us for spiritual victory (Eph. 6:14-17): girding our loins with truth; putting on the breastplate of righteousness; having shod our feet with the gospel of peace; taking up the shield of faith; taking the helmet of salvation and the sword of the Spirit, which is the word of God. There are other means, also, such as worship and fellowship with others in the body of Christ. The point is, you can’t win most battles against our spiritual enemy by prayer alone; also, you must fight, using the means that God has provided. 3) GOD’S LEADERS AND GOD’S PEOPLE FIGHT BY REMEMBERING GOD’S PERPETUAL OPPOSITION TO THE ENEMY. God directed Moses to write in a book as a memorial and recite it to Joshua that He would utterly blot out the memory of Amalek from under heaven. Then Moses built an altar and named it, “The Lord is My Banner.” It was to remind Israel, “The Lord will have war against Amalek from generation to generation.” And it was to remind them of how He provided victory in this first battle. A banner is a military insignia raised on a pole during the battle. As long as it’s still flying, the soldiers know that the battle is not lost (Ryken, p. 466). The Lord Himself was Israel’s banner. Jesus Christ and His cross are our banner. He was lifted up to die for our sins. He was raised up in victory over the enemy of our souls (John 12:31; Col. 2:15). When we fight against the world, the flesh, and the devil, we can look to Christ crucified and know that we can conquer in His mighty name. Someone has said, “The only person with all his problems behind him is probably a school bus driver.” If a church has people, it will have problems. But whatever the problems, whether from within or without, we also have Christ, the living water, always available to us in this wilderness. He promised the sinful woman at the well (John 4:14), “Whoever drinks of the water that I will give him shall never thirst; but the water that I will give him will become in him a well of water springing up to eternal life.” Make sure that you stay hydrated! Drink often from Jesus, the living water! How can you address a legitimate problem in the church without falling into the sin of grumbling? When do a leader’s imperfections call for correction rather than just letting them slide? What sorts of problems come from the world? The flesh? The devil? Do we need to determine the source to fight these problems? Discuss with a friend: In salvation, we are passive, but in sanctification, we must be active. Use biblical support.